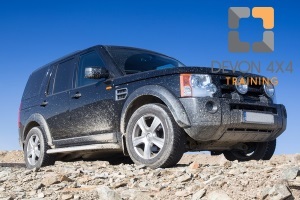 Our on and off-road training courses for professional 4×4 drivers are designed specifically for operators using these vehicles in a work based environment. We work with a wide range of clients with very demanding requirements, from adverse weather on-road driver training, to severe cross country off-road driving. Courses vary from a single day 4×4 familiarisation course, run with two candidates from their workplace, through the one or two day Lantra-Awards 4×4 Professional Off-Road Driving course, to a comprehensive 4×4 Instructor training course (depending on candidate qualifications and legal requirements). Costs range from £400 to £700/day, either from your workplace, or at one of our Lantra-Approved off-road training sites in north and east Devon, depending upon vehicle requirements and candidate numbers.